Face masks are an excellent way to nourish, clean, and treat the skin. However, if you’re tired of the skin-cracking concoctions that take a lot of minutes to dry completely, then this transformative treatment, which is better known as Purifying Mud Mask by AHAVA, is what you should try. This product contains a variety of ingredients that are perfect for making your face look healthy and brighter. Here is a complete AHAVA Purifying Mud Face Mask review. Since it is a clay-based mask, it contains Dead Sea mud and kaolin, which work as a detoxifier and make the skin smoother and healthier. It also contains sea salt, which is an excellent scrubbing element, and lactic acid, which works as a chemical peeler. Moreover, it has glycerin, jojoba oil, and aloe leaf extract that are moisturizing elements. Apart from this, horsetail extracts and witch hazel work as an astringent and lessen skin irritations, and chamomile extract and panthenol work as an antiseptic and anti-oxidant. This mud mask has an agreeable, clay-like consistency, which makes it quickly applicable. It is not gritty, oily, or drying. Another good thing about it is that it has virtually no unappealing synthetic fragrance; it only smells like natural mud. 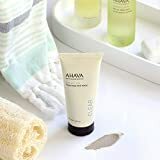 The AHAVA Mud Mask comes in an off-white upside-down, tube-like, plastic bottle and a black flip-open cap which allows it to stand firmly. The cap helps keep the mud mask formula safe from dirt, pollutants, and excess air so that it doesn’t dry out. Moreover, you can get the detail related to the usage and ingredients, printed in plain black letters, at the back side of the bottle. The after results of this product are miraculous. It leaves the skin clear, soft, and smooth. Not just that, but it also lessens the blemishes and pimples. Another good thing about this scrub is that it doesn’t make the skin dried out but softer than before. Moreover, it’s not just a mask as it works as an exfoliator too. It has fine grains of sea salt that cleanse the skin deeply and make it look refreshed. Also, it works very quickly; you don’t have to wait for ten or more minutes to dry it out so that you can wash your face. It can be easily spread over your face and comes off nicely too. It smells pleasant and fresh. It also helps exfoliate the skin. It only needs to be put on for two minutes and hence, saves time. It helps reduce blemishes, pimples, and acne. People with dry skin might find it overly drying. The AHAVA Purifying Mud Mask has gained 4.4 out of 5 stars. About 87% of the consumers are satisfied with this product and the excellent results it renders. Users have said that it is a fantastic product that leaves the skin smooth and soft. Users were also happy about the fact that this product helps reduce blemishes and pimples, which is what everyone wants. It is unquestionably one of the most exceptional mud masks that contribute to exfoliating the skin.